Sam Maloof is acknowledged as one of the finest woodworkers of our time. As a leader of the California modern arts movement, he designed and produced furniture infused with profound artistic vision for more than half a century until his death in 2009. 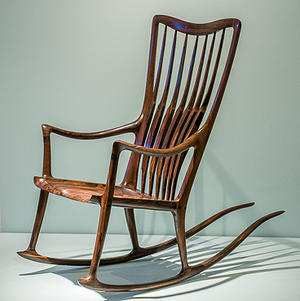 Maloof’s work was the subject of a prestigious retrospective at the Smithsonian American Art Museum’s Renwick Gallery in 2001 and is part of their permanent collection. His furniture is in some of the most important private collections in the nation and the permanent collections of the Boston Museum of Art, the New York Metropolitan Museum of Art and many other fine museums. In 1985 he was named a MacArthur Fellow and later received honorary doctorates from the Rhode Island School of Design and other institutions of higher learning.